Parales’ experience is a common one for many foreign residents in China. The country is now facing an expatriate exodus, with foreigners unwilling to put their health on the line to live in a place with an increasing number of smoggy days. For the hundreds of millions of Chinese who have nowhere else to go, the problem of air pollution has become a matter of life and death. This was a dramatic turnaround from the Communist country, which had previously resisted calls to reduce emissions, which would stunt its phenomenal growth rate. It was not empty rhetoric. Around the same time China announced a ban on the consumption of “dirty” coal, which took effect in January 1, this year. China is at once the world’s largest producer, importer and consumer of coal. In 2013, it produced 46 percent of the world’s coal and consumed over half of global coal. In the last five years Chinese buyers have become increasingly cozy with Australian miners. In 2010, Australian coal accounted for 22 percent of Chinese imports; by last year that share had almost doubled. In 2014 Australia, the world’s second largest coal exporter, shipped 93.4 metric tons to China, worth $7.58 billion. Claimed as one of the Coalition government’s crowning achievements in the foreign policy arena, the signing of a free trade agreement with China last year removed import tariffs on Australian minerals, worth A$15.5 billion ($11.4 billion) a year. The tariffs had been imposed unexpectedly by the Chinese government in October last year, in a fit of protectionism. In most cases the tariffs on Australian minerals were lifted immediately after the signing of the FTA, but for thermal coal a six percent tariff will remain in place for two years. In the meantime, Australian exporters will also be faced with the dirty coal ban. According to consultants Wood Mackenzie, none of the 54 metric tons of thermal coal Australia exported to China in 2013 would have met the standards had they been in place then. Indeed, the Australian Department of Industry expects imports to increase over expectations if the new standards can be met. But the publicly expressed optimism from the mining industry is not supported by the numbers. Since the introduction of the dirty coal ban, Australian coal exports to China have fallen off a cliff. 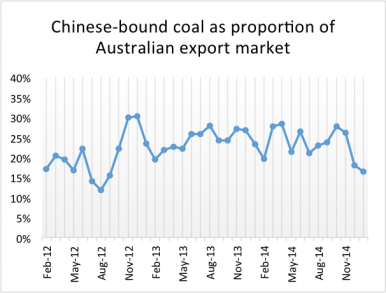 In February 2015 Australian coal exports to China were down 17 percent on February 2014, despite no significant change in worldwide exports between the two periods. The only good news for Australian miners in all this is that they have been spared the worst of it. Chinese Customs data shows that between those two February periods overall imports dropped by a third. Australia’s market share in the contracting Chinese import market has grown from 24 to 30 percent in a year. China’s dirty coal ban has been lauded in the international media as a bold piece of environmentalist action to tackle the country’s out-of-control air pollution. However, it is possible to see it as another piece of protectionist policy designed to prop up domestic producers, whose grip on the coal market has been slipping over the past decade. Despite its vast coal reserves, and a rate of production that outpaces that of any other country, China has ramped up its coal importation program in the last decade. In 2004 barely one percent of China’s net stocks consisted of imported coal. By 2012, China was importing almost 15 times that amount. While domestic production levels had increased by 77 percent, imports now accounted for 7 percent of its stock. In the same time period China’s coal exports, bound mostly for Japan and South Korea, declined from 866 metric tons to 93 metric tons. Part of the reason is geographical. China’s big coalfields are in the northwest, in Inner Mongolia and Xinjiang provinces. It is more expensive to transport coal from here to industrial centers in the coastal southeast than it is to ship Indonesian and Australian product from East Kalimantan and Newcastle. Now, when foreign coal lands in Chinese ports, it is subjected to a two-week microelements test by Customs to determine if it passes the new regulations. Details of the test have not been fully released, causing uncertainty among traders, for whom sending coal to China can now be a gamble. The regulations seem to be having some effect. Statistics released by Chinese Customs show that in February 2015 coal imports were two-thirds that of February 2014. “The launch of the new coal quality regulation is due to the excessive production and excessive production capacity by domestic coal industry, so it targets import coal,” says Yang Fuqiang, the Senior Adviser on Climate, Energy and Environment for the powerful National Development and Reform Commission. In late May, the Associated Press reported that domestic coal production fell by six percent in the first four months of 2015. Over the same period, imports fell by 38 percent. While energy consumption increased by 2.2 percent in 2014, coal consumption actually declined, down 2.9 percent. A complex array of reasons have been put forward to explain away this premature drop, from more efficient use of coal to a particularly rainy autumn that allowed the grid to lean more heavily on hydro sources. 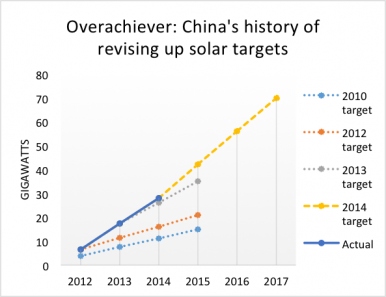 But when it comes to meeting energy targets, China has a history of overachieving. The classic example is in the country’s solar energy program. In 2010, the country’s Five Year Plan set a solar target of 15 GW by 2015, at a time when solar infrastructure was basically non-existent. 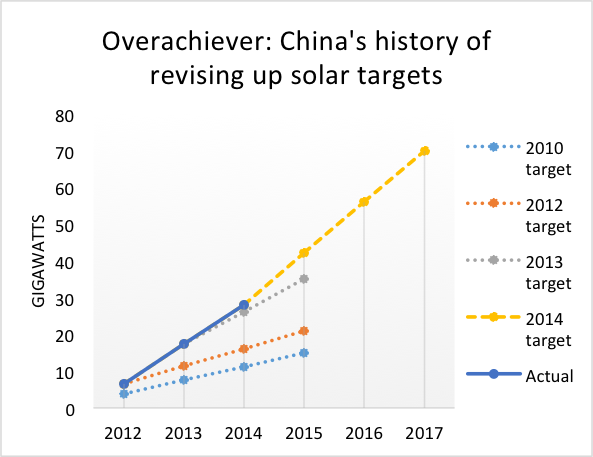 After successive increases, today the aim is to reach 70GW by the end of 2017 which, if achieved, would represent a tenfold increase in solar capacity in just five years. China is ramping up its clean energy production capacities. On the one hand, it cannot afford to allow its rate of economic growth to slow significantly, given the increases in living standards its industrialization is bringing its citizens. On the other, leaning too heavily on the burning of fossil fuels for too long will only make its cities – and the rest of the planet – uninhabitable. In late April, the National Energy Department issued a notice to provincial governments directing them to prioritize wind power in power production. Clean energy is a bit of a misnomer: In its annual statistical reports, the category includes hydro, nuclear and – most controversially, since its carbon emissions are only half that of coal – gas. 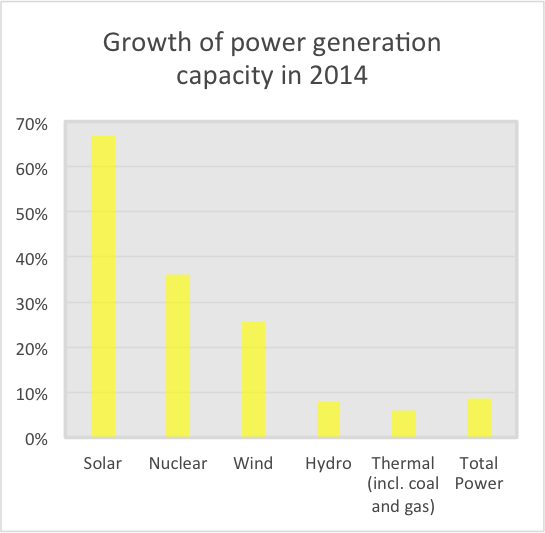 These electricity sources, as well as wind, are developing at an impressive rate. By the end of February 2015 wind capacity was 100GW, with a 2020 target of 208GW. China’s renewable energy target is 550 GW in 2017, about 10.2 percent of 2014’s total electricity production. Australian academics John Mathews and Hao Tan, writing in Nature, observed that China’s juggernaut clean energy growth is just as much about environmentalism as it is about energy security. The rapid pace of expansion, leveraged by its powerful manufacturing sector, has driven down the price of materials like wind turbines and photovoltaic panels. 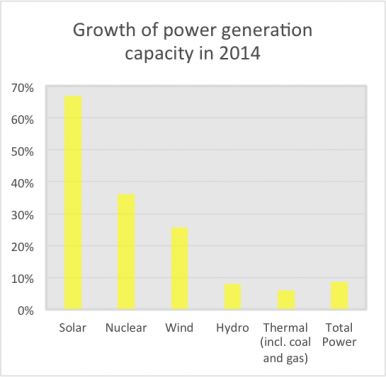 None of these come close to displacing coal as the main source of power yet. But the astonishing rates of growth across all these mediums suggests that when the Xi Jinping stands next to Barack Obama and commits to a 20 percent clean energy target by 2030, he is prepared to put his country’s money where his mouth is. Cecily Huang is a freelance journalist who previously worked for The Guardian’s Beijing office.